Four cows have gathered by a closed gate on a chilly autumn evening. A road from the pen trails through the flat landscape to a farmhouse. Dark clouds have fanned across the evening sky and are about to engulf the last rays of the sunset. After returning from his stay in Italy, Lundbye once again went back to travelling around Zealand painting scenes from Denmark’s nature and peasant life. In this painting, he has drawn inspiration from the Dutch animal painter Paulus Potter, whose works could be found at the Royal Collection of Paintings (known today as the National Gallery of Denmark). 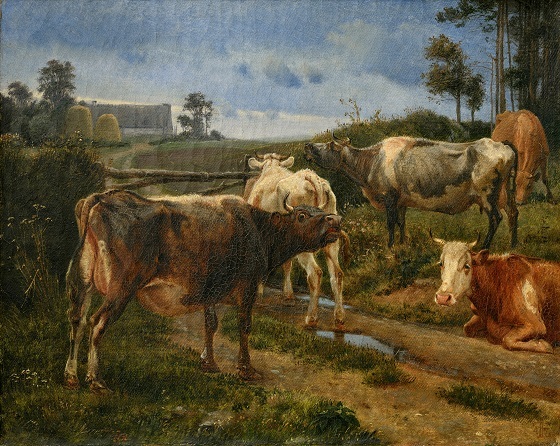 Lundbye was a great admirer of the Dutch Golden Age painter’s both precise and lifelike rendering of cows in particular, and closely studied several of his animal paintings during his brief stay at The Hague in the year prior to the painting of this work.